Poland's Agnieszka Radwanska beat former Wimbledon champion Petra Kvitova in three sets to win her first WTA Finals title in Singapore. It was the 26-year-old's first final at the event in her seventh appearance. 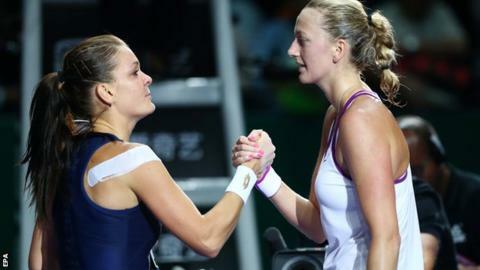 World number five Kvitova had knocked out five-time Grand Slam winner Maria Sharapova in Saturday's semi-final. A tearful Radwanska, the first woman to go on to lift the title after losing two round-robin group games, said: "It means everything to me, in my first final, I get my first win so it couldn't be any better. "I was doing the right thing in the important moments of a really close match. I had my chances in the second set but it doesn't really matter how I won."